The way to restore Windows 10 System image backup could save a lot of time of reinstalling Windows 10 system. 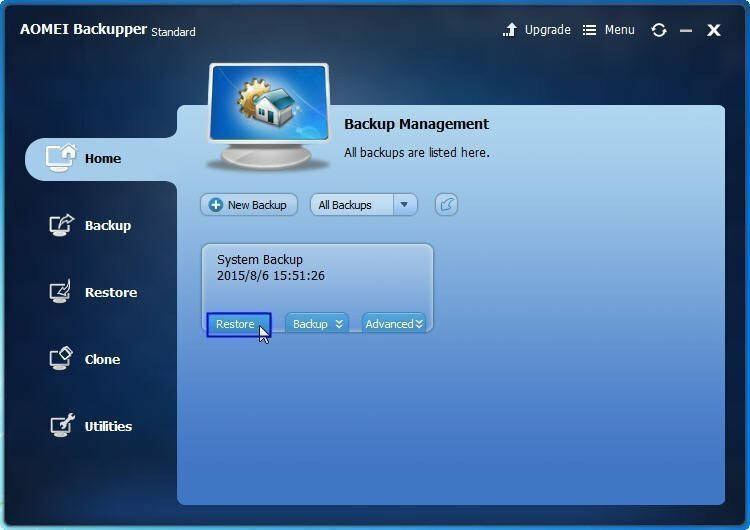 The freeware AOMEI Backupper can help you restore it in a few steps. Windows 10 system backup image restore is no strange to computer users based on restore Windows OS in previously. As the same reasons with Windows XP/Vista/7/8/8.1, restore Windows 10 system image backup could solve a lot of troubles and save a lot of time. If there are something wrong with your Windows 10 operating system, Windows 10 system recovery could solve those kind of problem. For example, system crashes. If the system crashed, the computer may work with something wrong, even won’t boot successfully. Thus, you have to re-install the Windows OS so that it can work normally. But installing an operating system and the applications will waste a lot of time. However, if you had make a system restore point Windows 10 before, you can restore it instead of re-installing one. It will save a lot of time. Besides, it can solve many other problems, such as disk broken, virus attacked, hacker attacked, etc. If you want to change a new PC but still want to use the old Windows 10 operating system, you can restore the Windows OS backup image to the new computer. Windows 10 system has its own backup and restore tool. However, the processes are very complicated. Well, find a third-party software will be a great idea to do backup and restore for Windows 10. Windows 10 is the latest operating system of Microsoft, thus, many software cannot support Windows 10. But AOMEI Backupper can support almost all the Windows OS, including Windows XP/Vista/7/8/8.1/10. We highly recommend you its free edition AOMEI Backupper Standard. Before you do, you should create a Windows 10 backup image at first. If the system is bootable, boot it directly. If the system won’t boot, you need one more step to create a bootable media so that you can boot the machine from this bootable media. Using AOMEI Backupper Standard to restore Windows 10 system image backup would be easier compared with Windows built-in tool. 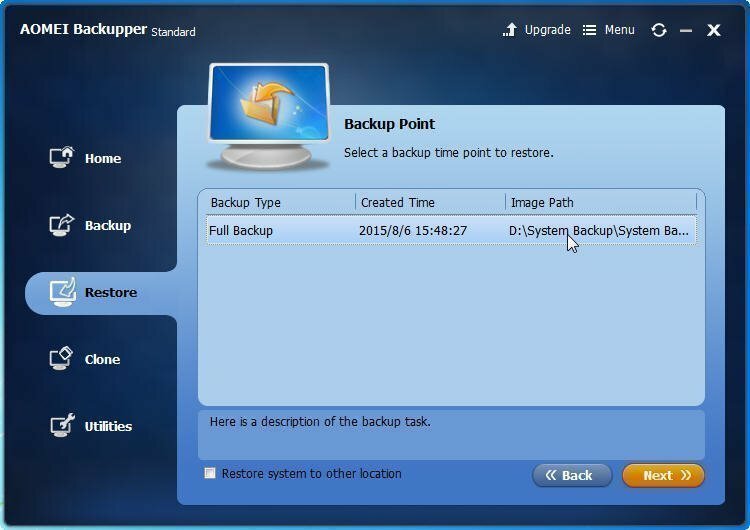 Here are the specific steps of restore Windows 10 system image backup with AOMEI Backupper. Step1. Launch AOMEI Backupper Standard. Click Restore under the “System Backup” file like the following picture shows(or you can click Restore at the left side). Step2. It will pop-out a window to remind you that this is about restoring system. And slip to “Restore” column, click Yes. Step3. Then, it will move to the “Backup Point” interface. Click the backup task, and click Next. Step4. Confirm the information of the source partition and the destination partition, click “Start Restore” to launch the process. When the process is finished, you will have restored the system successfully. But what if you are restoring the Windows 10 system backup image created by different hardware to current computer? We may change our old computer, but we won’t change the old system. If you are using the Windows 10 on an old machine, and you are planning to change it, how can you change the PC without changing the system? You can finish it by restoring Windows 10 system backup image to current new PC, which we called “Universal Restore”. 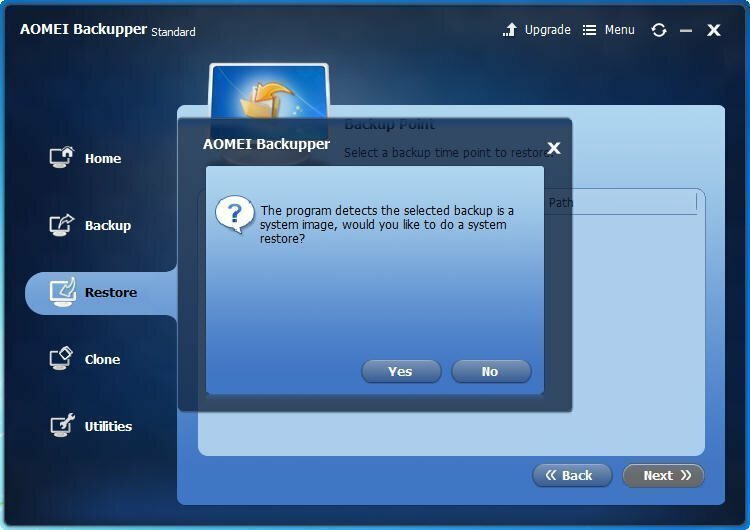 You can get this feature by upgrading to AOMEI Backupper Professional edition, and you can read more by clicking Restore A System Image Backup to Computer with Dissimilar Hardware.